After captivating the minds and hearts of the audience with her flawless performance in Padmaavat, Deepika Padukone’s look as the royal queen becomes a rage during Navratri as a Goddess idol is empowered by the grace and courage of Rani Padmini this Durga Puja. Bollywood’s leading lady Deepika Padukone created a storm at the box office with her last outing Padmaavat. The actress who slipped into the character of the royal beauty Rani Padmini garnered immense love and appreciation from the audience. The stunning beauty not only left an impression on the audience with her remarkable performance but her distinctive look also found a liking amongst the masses. 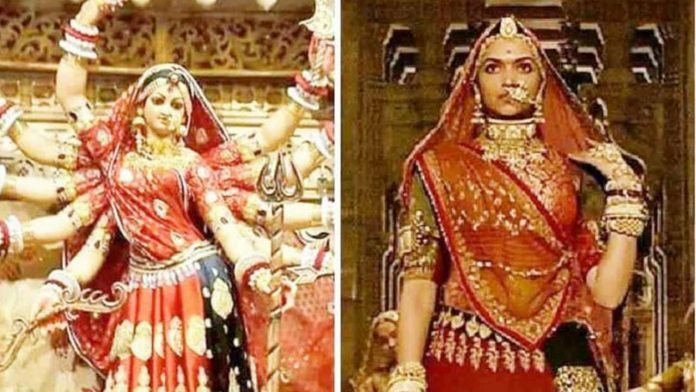 During the festive season of Navratri, a Goddess idol donning the avatar of Rani Padmavati from the Ghoomar song was worshipped, indicating the popularity of Deepika’s character. Deepika Padukone has time and again set an example with strong female characters that are idolized by the audience. Earlier, the actress has played the fierce, graceful, free-spirited and headstrong Leela in Padmaavat: the independent and self-sufficient, emotionally strong Piku; the brave and skilled warrior yet delicately beautiful Mastaani amongst others. Termed as the Queen of 100 crores club, Deepika Padukone holds the most number of seven 100 crores films, while her last outing Padmavat clocked 300 crores at the box office. With this, Deepika was titled the first actress to have entered the 300 crore club with a woman led film. Previous articleFarhan Akhtar’s ‘Jaane Ye Kyun Kiya’ Crosses 15 Million Views! Next articleTiger Shroff Got The Bollywood Grooving As He Started This Trend!